To the untrained reader, it may seem like I constantly push the products from Secret Weapon Miniatures. Truth is, I use lots of misterjustin's products because they work great for me. Same goes for other vendors that have great stuff out there. At this point in my hobby life, I'm tired of cutting corners and trying to make do. I'd like to use things that make the hobby enjoyable for me. All that being said, I got my hands on some of his new washes a few weeks ago and have been looking for ways to use them in my work. It's been tough since most of my recent stuff has had to be painted according to previously laid out color schemes and such for consistency. But... I have been able to try them out in a few places and I'd like to share my initial thoughts on them. It might help some of you make up your mind when it comes to buying a set or a few colors for your own work. There are basically two kinds of washes as far as I go. There are suspensions and solutions. Suspensions are washes that when left sitting for a period of time will settle and the material will separate from the liquid in the bottle. These require a good bit of shaking to mix up each time. Solutions are different in that the materials will not separate from the liquid no matter how long they sit on your shelf. The material has dissolved in the liquid and will not come back out. For those with kids... KoolAid is a solution. No matter how long it sits in the refrigerator, you don't need to shake it up before you drink it. Games Workshop washes are solutions. I can leave the Baal Red sitting on my desk for a few days, pick it up, turn it over and there is no pile of material sitting on the bottom that has settled out. Secret Weapon washes are suspensions. Leave them sitting for a while and the material will settle to the bottom. Now you need to shake it before using it. In the end, it doesn't make much difference as most of us shake everything before we use it anyway. Secret Weapon washes use the dropper style bottle similar to the kind that P3 uses. I don't like these at all. I understand they help you with proportioning out a certain amount of wash, but I don't care for them at all. I will say that I do like that these are clear bottles as opposed to opaque (as P3 wash bottles are). I like that I can see what's inside, how much is left and how "mixed" it may be before I go to use it. I don't like them because of the problems you can encounter with the tip. The slightest clog with some pressure build up and you can have a huge blowout of wash all over the place. Happened to me with a bottle already. This means you need to check the tip each time you go to use it and have something handy you can use to clear it out in the event you need to. It can be a pain sometimes. 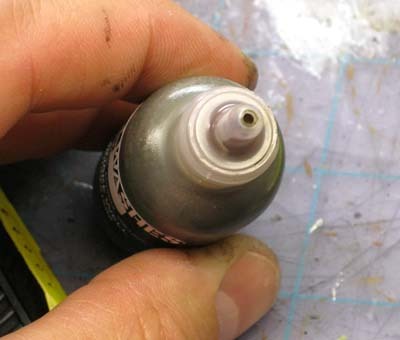 The one flip side to dropper bottles as compared to open pot types (GW style) is that if I bump one of the dropper ones over, next to nothing comes out of it and there's no mess. Do that to an open lid pot and you'll have a huge mess on your hands. How do they stack up to GW washes then? This is perhaps the million dollar question. I know it's what I was trying to figure out. In the end, I am sticking with Games Workshop washes for most of my subtle washing. That's right, a review where I say I'm going to use another product more than the one I'm reviewing. Follow me though. Here's what I don't like. 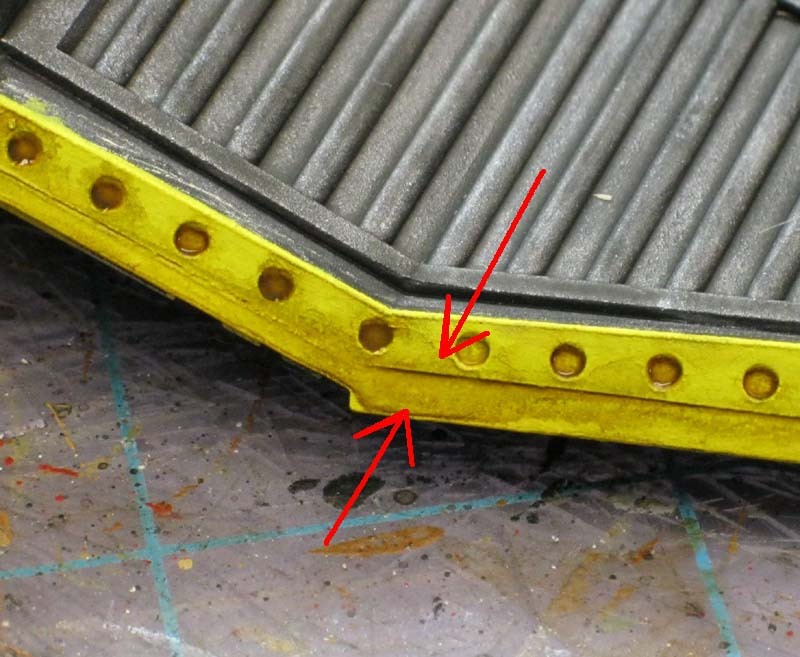 Despite the fact that I shook the wash up thoroughly and thinned it slightly (two things I don't need to do with GW washes), I still ended up with some marks around the edges of my wash area even though I was also careful with the amount I applied. I attribute this to the fact that it's a suspension and not a solution. The liquid dries and you're left with material on the surface of your model... but not always like you want it to be. Way too much work for something I need to get done quick. Washes are supposed to save me time and make things look better in the end with just a little bit of work. This is not it. But stick with me... 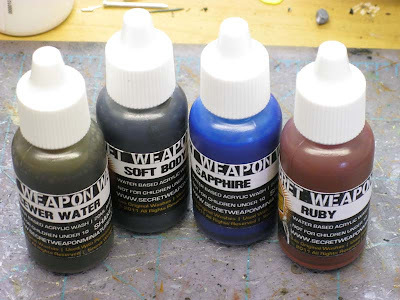 If I'm using the GW washes for shading models and such, what would I possibly use the Secret Weapon washes for? Why spend the money on another brand? These washes are perfect for weathering. Go figure. Almost all of misterjustin's products are geared towards that, but I'm going to be picking a few more colors so that I can expand my weathering capabilities. 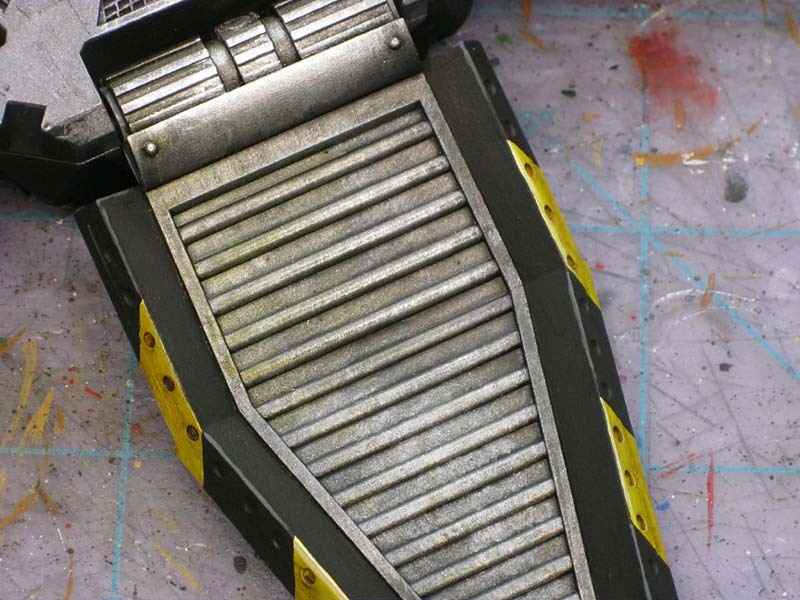 As I was painting the doors on my drop pod, I started to grab my GW washes for some weathering on the ramps. Then I thought about trying the Secret Weapon washes instead. They have slightly stronger pigment in them and I thought it might save me a pass or two like I have to do with the GW versions to get a nice effect. They were perfect. The stronger pigment makes them perfect for creating things like oil spills and grime buildup in crevasses. I'm sold. To buy or not to buy then? If you're comfortable with using GW washes and you'd like to have something a bit stronger that you can use for weathering, I'd absolutely recommend picking up a few colors. 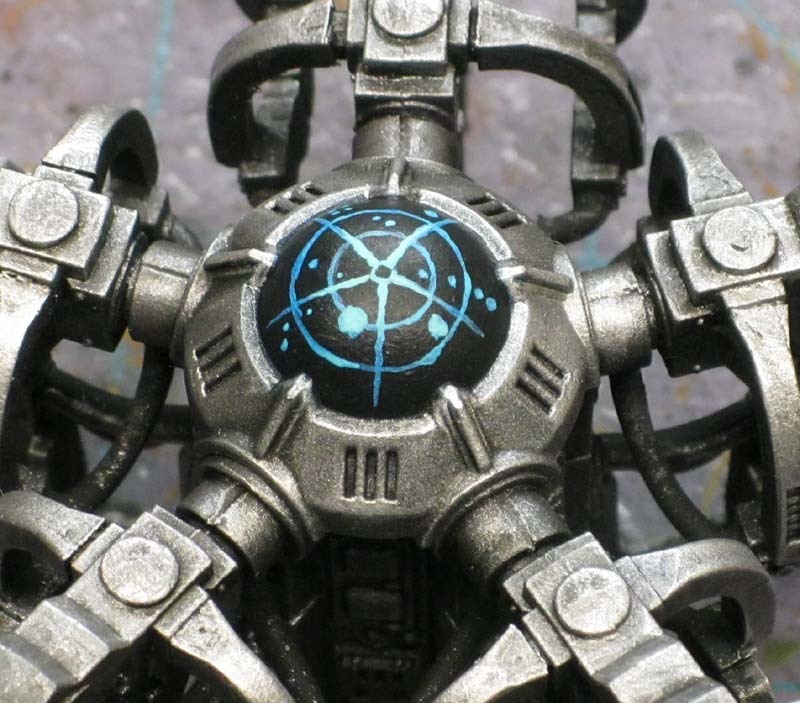 They will make it easier to get some nice weathered effects like grime on metal and such. You won't need as many passes like you would with GW washes and you've got a wider selection of colors to choose from. As for myself, the Secret Weapon washes will be replacing the normal GW washes I use when it comes to working over metals. I like the GW washes, but I like these more. The metallic hides the imperfections of the wash more than flat colors do and the variety of colors is definitely a plus. I am curious to try these on something like a Grey Knight model to see how it comes out. Not willing to leave it at that, I thought I would try something else with the Secret Weapon washes while I had them out. Instead of shaking them up before using them, I decided to leave them settled and just use what had remained "mixed." You know, use the stuff that remained dissolved in the liquid to see if it made any difference. I'm sill on the fence about doing it this way, but it may have potential. The wash appears to be slightly lighter. It's not as strong as if I had mixed all the pigment back into the liquid before applying it. That makes sense. It also seems to be a bit smoother. Again, because I did not mix the undissolved material back into the liquid, the wash seemed to dry as smooth as GW washes. I used the blue over the digital display elements on the center console above. I got a nice effect by adding the "unmixed" wash and then selectively removing the center portion for added contrast. This somewhat unorthodox method definitely needs some more investigation. I think it has potential depending on the color wash you're using and the color paint it's going over. In the end, I'd certainly give these a thumbs up for someone who is already comfortable using and working with washes and is looking for a brand they can use (that is a bit stronger than a GW wash) to get some nice weathering effects on their models. These may not be the set for someone looking to start out, but once you've got the hang of it, these will certainly add a few more options to your painting. Will they replace your GW washes? I don't think so, but I can tell you they'll give you few more options/results you don't get with the GW ones and for that alone, I'll be using mine. Recently I had the chance to try out the washes again (without mixing) when it came to painting white armour and the results were better than I imagined. You can read the whole tutorial here and see how the Soft Body Black wash fared in this process. excuse my previous comment on the secret weapon miniature wash prices, just went through them again, and the price for what you get is rather good. if you bough a single GW pot of wash, its $6 australia for 12ml. SWM washes are about $2.70 australian for 20ml. SWM i do apologise, thats better value for money. I must say I am very happy that I added this blog to my daily stalking. I feel that a lot of blogs get too engrossed into the tactics and not enough into the rest of the hobby (painting). With that said I'm looking forward to improving my painting skills and see this blog assisting me a great deal! Give my blog a look if you want to see a true newbie stumble through the warp. Ron, thanks for the honest, unbiased review! With a GW or Vallejo wash you can just slather the stuff all over your model and not have to worry very much about cleaning it up. This is because there's so little pigment in them. With the SWM washes if you do this on flat surfaces you're going to get edging, like you did, just like you would with a thin paint -- because that's what you're working with. Because you are effectively working with a very thin paint you can use it like you would a glaze. Wet the brush, dry it slightly, and then pull the colour where you want it. Works like a charm and can be used to create very effective, quick blending. These are the original Les' Washes from Awesome Paint Job - so if you want to see them in action for projects that are NOT weathering be sure to check out his videos. @Mephistopheles: No worries, mate. You're not the first to come back after doing the math and say "oops!" The profit margin on these is also really slim for me. You can also still find the Les' recipes online. He left them out there. But once you do the math you'll find that you can pick up all 20 of the current washes for about the same price as making 6 of your own. @Anon: I'd rather have a good, honest review than a biased, dishonest one. No complaints from me on this post! Great article and review, thanks for posting Ron. yeah its a bummer when the tips of drippers clog up. makes sense with these washes as its clunks of pigment in a suspension, so id say just keep a needle or toothpick or 2 in your hobby area. i can definately see how they would work better at weathering that GW washes. 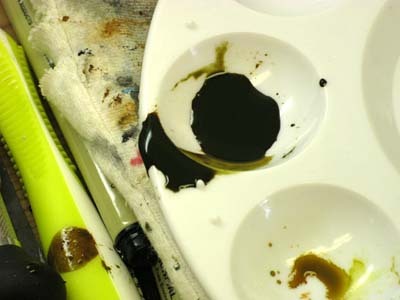 with the pigment just suspended rather than blended in, has more chance to build up towards the bottom of what your workin on as it dries, streaking as it moves down the miniature and drying. much how watered down GW ink did. i must admit, while i do like the colours of the washes, what i dont like is price you pay for the amount you get, same as with GW paints. not being biased here. though i wouldnt say out right no to purchasing a few, just to support a good bits and bases source. Anon: It's not about choosing someone to promote your product. What kind of service would it be for FTW to review something and simply say "they're great" or "they stink" without taking a closer look at them and letting you know how I feel about them personally? I like to think that readers would much rather have an unbiased review of something than some glossed over promo. And misterjustin knows that when I use his stuff and other's products as well, I'm going to tell readers what I think about it honestly. He has been kind enough to add a comment with some additional info on the washes as well. ServvsUmbrarum: Hopefully FTW can help you sort out some new techniques and such when it comes to more than just playing the game. Pro quality article, lovely and rich info-wise read. Anon: Sometimes it can be hard to tell and not everyone is joking unfortunately. javi: Thanks for the comment. Da Warboss: I haven't used them yet. If I do get a chance to try my hands at them, I'll certainly post up my thoughts though. Maybe I can see about getting my hands on some. I've got some of this washes and they are pretty good, but really different than the GW ones. My only complain is that they dry too shiny (but that can be solved using Matte Varnish) and that the flesh tone is way too yellowish for my tastes. Good review Ron, though it does come to mind that if the GW washes are a suspension then its more to do with solubility than anything else. you could try warming your bottles up a few degrees to increase solubility in the short run or increase the amount of solvent (ie. water), either one will increase the amount of solute that can be taken in by the solution leaving to less crystallisation of the material as it drys. think i might but the set to give it a crack, does SWM send international? Satire tends to be blended in with insults on the oversensitive blogosphere. Mr Saikowski was just anticipating more trolling as per the norm in recent times. It has its places, but 40k attracts lots of trolls that blur the divide between said humour and outright insults. I think I am among one of the first bunch of ppl whom got the washes when it came out. So now I mix the wash with GW paints to for base coating as subsequent paints could kill off the shine. Personally, I will be buying/restocking when my set runs out, and I strongly suggest everyone to give it a try, it's a very, very good product. Well that's more than one person now that has mentioned shine - which is just odd because we only use matte materials in the mix. I'll have to look into that. I actually have a chemist coming by shortly (he's due in 6 minutes, actually) to look at the wash mix and our setup to see what can be improved upon. @Vegel: thanks for posting a great review! I'm going to try and get in touch with you about getting some pics of those goblin shields. They look great! Diluting with some matte medium would probably work. Will have to buy & try. Heiki: Definitely. I use mine for weathering purposes. They don't replace my GW ones, but they've certainly found a spot on my painting desk for certain applications... no doubt about that. Great Review. 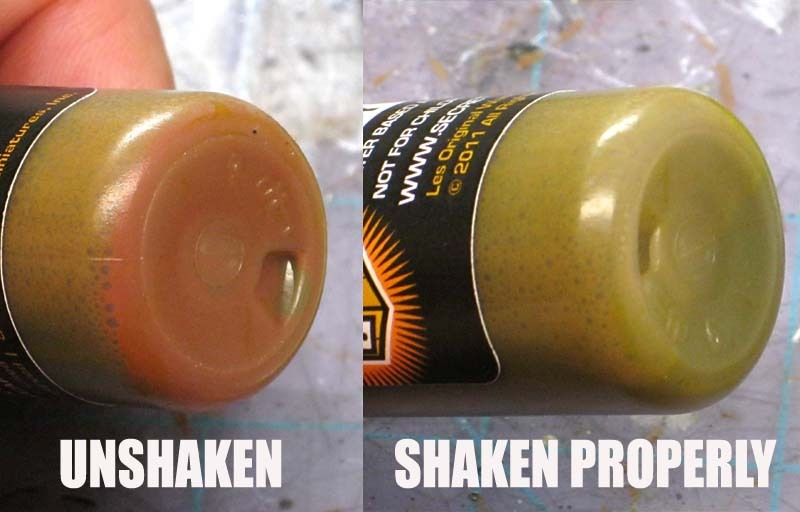 I personally used the original wash recipe for the last 6 months with very good results 99% of the time and I do see that even though the formula uses Matte medium, it does still leave a sheen to it which I suspect may be more from the pigment (originally the FW Inks). I have found that I can easily counter this and get a true Matte finish to the mixes by simply adding ULTRA Matte Medium instead. Even just a few drops of Ultra kills the shine for me. I also noticed that it reduces the amount of air bubbling I get in the bottles when I shake them. Not sure why but it does. So if your sticking to the Original Wash recipe Les created then trying the Ultra Matte Medium might work for you the way it does for me. HeavyBolter: Thanks for the tip! Mister Justin, Did you end up changing the recipe? I'm looking for a new black wash to use.